Did the Nazis meet in a “gay” bar? It is an assertion made by the German Journalist, Heinz Hohne in "The Order of the Death's Head". The assertion was popularized by the fraudulent anti-gay book, "pink swatiska". Hohne's book was originally published in German in 1966, translated into English in 1969.
tl;dr: yes, there were gays among the NSDAP leadership, but they killed them in 1934. The article you posted talks about Ernst Röhm, chief of staff of the SA (Sturmabteilung) between 1931 and 1934. The SA was the paramilitary wing of the NSDAP responsible for fighting street riots against opposing political groups and for harassing and intimidating political opponents. It did not represent the NSDAP as a whole, which also consisted of many other independent sections like the SS, the Gestapo and the political part. Although the official party doctrine of the Nazis was anti-homosexuality, it was an open secret that Röhm and many other leading SA members were gay. Hitler tolerated this because Röhm was an old friend of him and (at that time) very loyal to him. Röhm and many of his inner circle were murdered by other NSDAP members in 1934 during an internal purge operation called night of the long knives. The main reason for this action were internal power struggles between Röhm and Hitler: While Hitler wanted the Reichswehr to be the core of the Nazi state, Röhm wanted the SA to play a much more prominent role. This turned Röhm into a threat to Hitler. 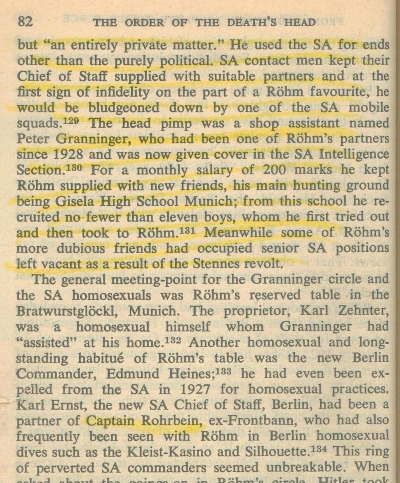 Whether or not Röhm's homosexuality was a factor in the decision to murder him and his inner circle is unknown, but it was later used to justify his murder to lower-ranking SA members. Fact is that the persecution of homosexuals in the 3rd reich intensified when Röhm's influence waned. This supports the hypothesis that Röhm and his circle represented a gay lobby inside the NSDAP which was rooted out in 1934. Were 1200 black soldiers massacred at Camp Van Dorn in 1943? Did travelers by troika throw passengers before the wolves, to save others? Are Elie Wiesel and Lazar Wiesel the same person? Did a nuclear blast devastate Port Chicago on July 17, 1944? Do the English eat “pork” instead of “pig” because they were servants of the French? Did Polish government institutions collaborate with Nazis? Was Robert Capa’s famous 1936 war photo “The Falling Soldier” a faked photo?